“Ambassador opened by noting his surprise that the Central Bank Governor had gone public so soon (March 3) about the Government’s intention to negotiate an agreement with the IMF. Cabraal responded that he had information that the Opposition UNP Party was about to leak the information with a highly unfavorable spin, so the President had authorized him to explain the Government’s reasons for seeking IMF assistance. Cabraal said the decision had been correct, and opposition criticism thus far had been more muted than expected” the US Embassy Colombo informed Washington. The Colombo Telegraph found the related leaked cable from the WikiLeaks database. 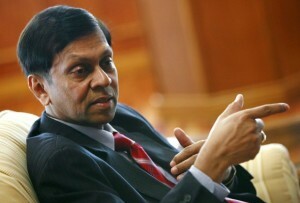 The unclassified cable discusesSri Lanka’s debut sovereign bond issue. The cable was written by the Ambassador Robert O. Blake on march 12, 2009. “Cabraal said the Government would address its fiscal deficit, both by raising revenues and cutting spending. He declined to specify what specific revenue measures Sri Lanka has in mind, noting only that new taxes on imports are under consideration, even though such taxes would adversely effect inflation, which recently had come down to 7 percent. He also predicted the Government would realize savings from declines in defense spending as the war in northern Sri Lanka winds down. Cabraal told Ambassador that he expects the IMF team to come back to Sri Lanka in the very near future with a view to negotiating an agreement in as little as one month’s time.” Blake further write. WHY DI D YOU GO TO COMMERATE JR JAYAWARDANA DEATH OR BIRTH W/E? WHY YOU STUPID MORON. I AM SUPPORTER OF YOU BUT DO NOT DO THIS ANYMORE. THIS IS THE GUY WHO DESTRYOED SRI LANKA FOR 35 YEARS. THIS THE GUY WHO PAVED THE WAY TO PEOPLE LIKE RAJAVASSAS TO COME IN TO POWER AND DO W/E WANT.